The CITES treaty established a program for monitoring the illegal killing and hunting of elephants (MIKE) worldwide to systematically gather information on the illegal killing as well as trends in the population of elephants in Africa and Asia. The Samburu-Laikipia ecosystem is one of the four MIKE sites in Kenya and it has the second largest elephant population in the country. This population inhabits a complex unprotected home range comprised of vast communal trust, community group ranches and conservancies, small national reserves, private ranches, small-holder agricultural farms and settlement schemes. The key factor for gathering mortality data in Samburu-Laikipia is to win over the local communities so that they give information on the whereabouts of dead elephants and what killed them. This project aims to record elephant mortality through carcass verification in the complex Laikipia-Samburu MIKE, and to develop an appropriate methodology for implementing MIKE by building a sustainable local information network through training local people to gather systematic information on elephant mortality. This project has been operational since 2002 and it has built a large elephant mortality network encompassing individual informants, private ranches, community groups and county councils among others. In 2006, local field assistants will begin filling in elephant carcass reports under close supervision of the principal investigator. 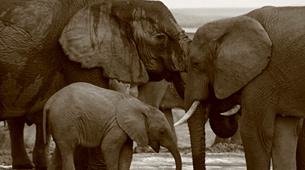 As a result of this project, the technical advisory group of the CITES-MIKE programme has endorsed ëlocal information networkí as a sound scientific methodology for monitoring the illegal killing of elephant in wildlife non-protected areas as one of the solutions to the problem of implementing Mike in a complex ecosystem. This project has been launched in response to increasing human-elephant conflict in Cambodia. Human communities unused to living near elephants are migrating into forested elephant ranges as the Cambodian human population expands resulting in human-elephant conflict. This project acts to prevent retribution killings of elephants by ensuring that the frustrations of local people are promptly addressed by government decision makers. Project staff also ensure that land use planning guarantees suitable conditions for elephant ranges. Development of locally-applicable human-elephant conflict mitigation methods in rural Cambodia and Conservation Capacity Building for national project managers. Only in the past two years has human-elephant conflict been examined systematically in Cambodia. With the establishment of the nationwide human-elephant conflict response units (in-part funded through IEF), a hub and communication network has now been established throughout the rural areas of Cambodia. Rapid responses have meant that local people and agriculture officials have had access to the latest mitigation advice provided by trained field staff. This project has been so successful that no retribution killings of elephants have been reported since project startup. In the coming year, project activities will continue with an increased focus upon improving the mitigation methods available including the development of improved chili-based agriculture (such as growing methods and seed sourcing), and the initiation of transferring project responsibility to national agencies to ensure project sustainability. 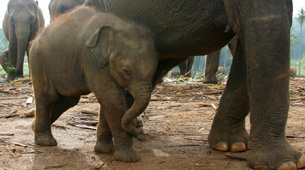 Cambodia is host to two of the largest contiguous elephant habitats left in Asia. The Cardamom Mountains region & the Province of Mondulkiri are approximately 1 million ha of forested elephant habitat, presently undeveloped by people. While elephant population sizes are low (approximately 100 animals in each area), the potential for long term viability of large herds is extremely high, if poaching and habitat loss can be controlled. Though Cambodia has an impressive 53% forest cover, the human population growth rate of 2.7% puts the large forest areas under severe pressure to be replaced by agriculture and industry. Key government policies on land reform, relating to land tenure for small holdings, as well as guidance on human-wildife conflict mitigation are not yet in place. This leaves a chaotic set of circumstances for forest-edge communities who are unable to absorb the impacts of elephant damage. This phase of this multi-year IEF supported elephant conservation program will conduct studies at human elephant conflict sites and provide mitigation methods to farmers such as noise systems, deterrent methods (scarecrows and hammocks with smell of perfume), chilli fences, chilli ropes, and chilli dung to demonstrate that there are many options to prevent elephants destroying crops. Education programs and strategies for alternate crops will also be studied and provided. For example, traditional Cambodian religion encourages farmers to grow bananas and sugarcane for people to offer to the Goddess Yey Mao, to protect them. This project educates the farmers on alternative crops less appealing to elephants. In 2005, a pilot site for growing chilli was established with harvests already being sold in tourist spots. However, in order to improve harvests to a level where there is sufficient chilli to provide an income, wells need to be constructed as rainfall in Cambodia is seasonal. Though expensive, wells will not only improve the agricultural yield, but improve living conditions for the very poor families in the area. Recently it was discovered that Taro, a tuber used in soups & desserts with its leaves fried as vegetables, appears to be unpalatable to elephants and brings a good price in the markets of Cambodia and Vietnam. This project will assess the suitability of planting this crop in human-elephant conflict (HEC) areas. This project will also manage and advise on HEC events, providing short term emergency advice, as well as longer term mitigation strategies. Local farmers will be provided assistance to prevent and actively deter elephants in a humane manner, and specific training will be given in early warning and inter-plantation contact systems, as well as compiling HEC event report forms for central database deposition. Printed t-shirts will be provided to members of these guarding groups, to ensure they feel like part of the team. This will be combined with simple awareness raising initiatives throughout the year for local farmers and their families.